Jùjú music, so popular in the 1970s and '80s, seems to have gone into eclipse in southwestern Nigeria, the land of its birth. Even fújì, which took its place for a time, has mutated into something rather removed from its origins. In their places, in the popular music arena at least, are variations on international hip-hop, heavy on auto-tuned vocals and synth. Styles may come and go, but King Sunny Adé, the best-known jùjú musician outside of Nigeria, still keeps up a busy worldwide touring schedule. It's hard to believe he just turned 70! 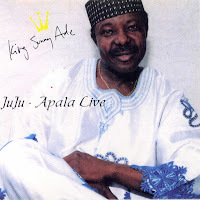 Juju-Apala Live (Fortune Records, 2000) captures the King at the top of his form in front of a live audience in Lagos. Maybe it's just me, but before his fellow Nigerians, Sunny and the African Beats seem a lot more relaxed and uninhibited than they've been in front of US audiences, at least at the concerts I've been to. 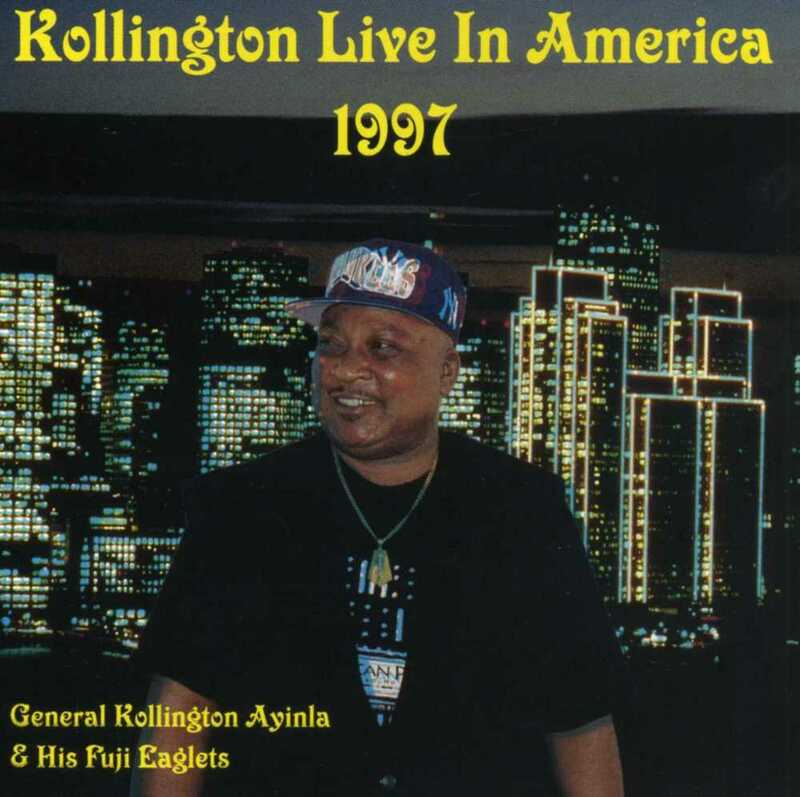 I suspect this CD is a bootleg recording, as it wasn't released through KSA's usual outlets. 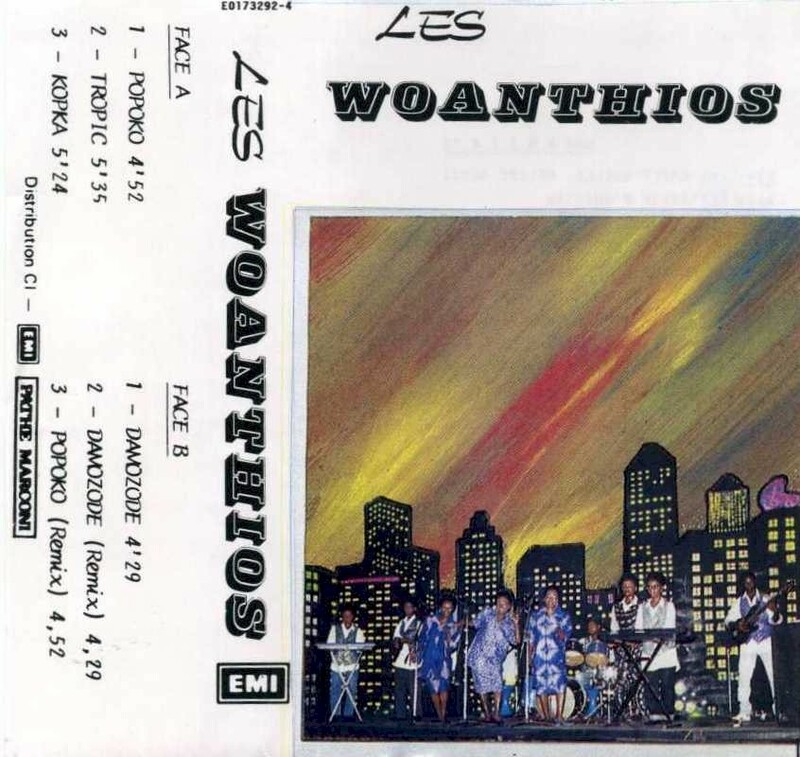 Moreover, my copy was an unauthorized rip of the original release - a pirate of a bootleg! What's really ear-opening in this CD is the extended workout on Track 4, "Juju-Apala," with Musiliu Haruna-Ishola, son of the legendary Haruna Ishola, who perfected modern àpàlà music in the '60s and '70s. 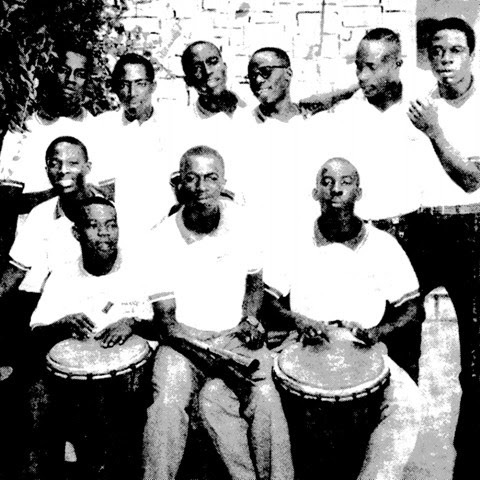 Àpàlà, a very traditional form, is one of the foundations of jùjú, fújì and other Yoruba musical styles, and Musiliu is ably carrying on his father's work. The past and the future meet in Juju-Apala Live! Download Juju-Apala Live as a zipped file, complete with album artwork, here. Now, this is an album I've been wanting to post for a long time! 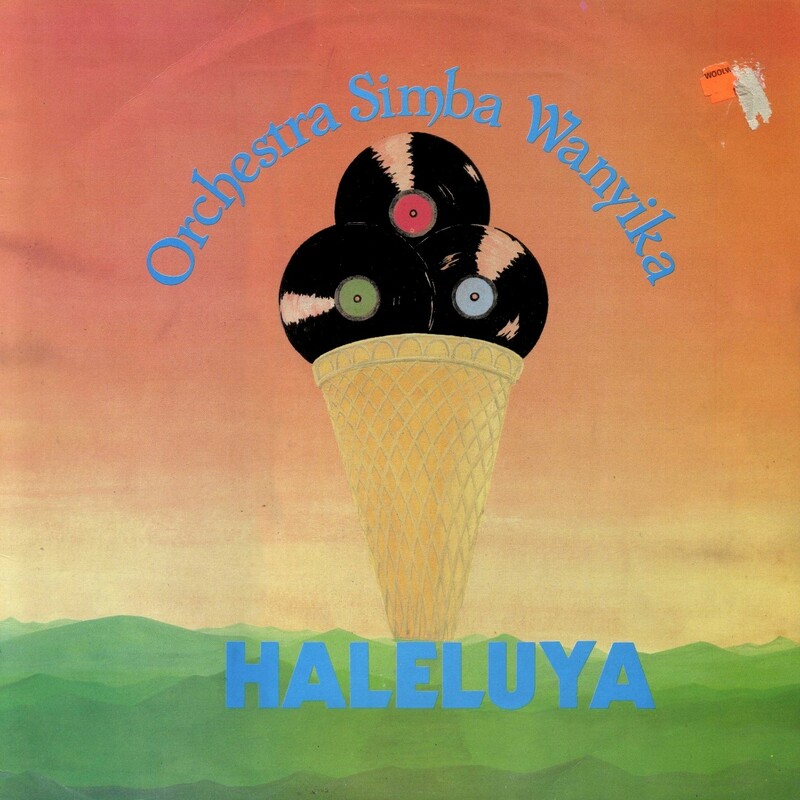 Orchestra Simba Wanyika (Swahili for "Lion of the Jungle") was founded by the brothers Wilson Peter Kinyonga and George Peter Kinyonga of Tanzania, who joined the popular Jamhuri Jazz Band in 1966, where they served four years before leaving in 1971 to form the Arusha Jazz Band. A move to Mombasa, Kenya and a name change and in 1973 Simba Wanyika was born! They were to play a crucial role in the East African music scene for more that twenty years, giving rise, directly and indirectly to a plethora of other groups: Les Wanyika, Wanyika Stars, Orchestra Jobiso and many others. 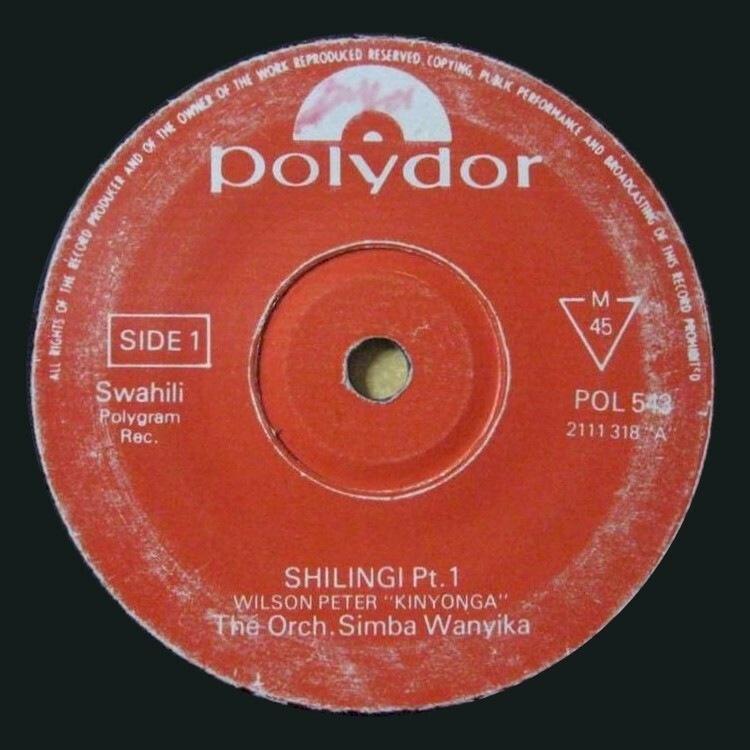 For more information about Simba Wanyika and its offshoots, go to the discography I authored with Doug Paterson and Peter Toll some years ago. Haleluya (Polydor POLP 552, 1985) marks the high tide of Simba Wanyika's influence and creativity, following a flock of hit songs and right at the moment cassette tape piracy began to cripple the East African music scene. The band would go on to tour in Europe in 1989 and internationally in 1991, when they recorded their only world-wide release, Pepea (Kameleon KMLN 01, 1992). Sadly, George Peter Kinyonga passed away on Christmas Eve 1992 after a brief illness, and Wilson followed him in 1995. Although there was at least one recording made under the "Simba Wanyika" tag without the brothers, the band dissolved shortly after. Download Haleluya as a zipped file here. 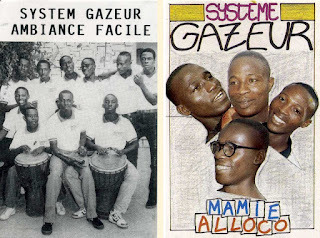 Système Gazeur, in Ambiance Facile (EMI E06991-4, 1991) reject the electronic affectations of more recent zouglou artists like Magic System, Sur-Choc and Esprit de Yop, opting for a more organic, traditional vocal and percussion sound. It's truly execptional! Download Ambiance Facile as a zipped file here. Download Mamie Ton Alloco as a zipped file here. Absolutely outstanding in every way. This virtually all girl group, whose popularity in the Ivory Coast is second only to 'Woya', are magic through and through. Which isn't surprising as their rich and varied modern dance music has retained its ethnic roots with a great beat, some really lovely guitar and absolutely smashing vocals. Ble Clotilde shines out both on lead guitar and vocals with a style of music that is very different from what you would normally expect from this part of Africa. My favourite tracks are 'Kopka' and 'Damozode' and that was a very difficult choice to make as dance wise 'Popoko' will leave your socks smouldering! To that I have nothing to add. It's great! Download Popoko as a zipped file here. 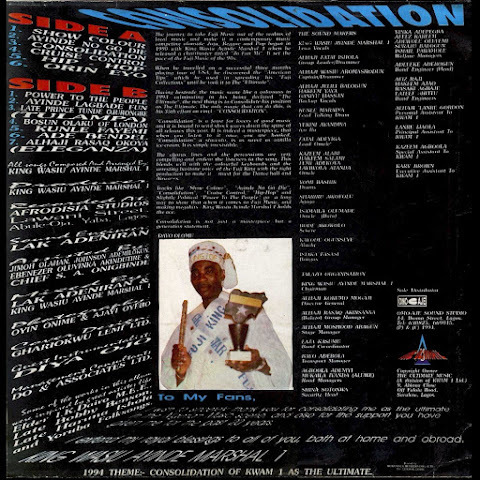 A few days ago I posted an album by King Wasiu Ayinde Marshal 1, one of the reigning triumvirate of fújì music in the 1980s. The other two were Sikiru Ayinde Barrister and Kollington Ayinla, whom I present today. 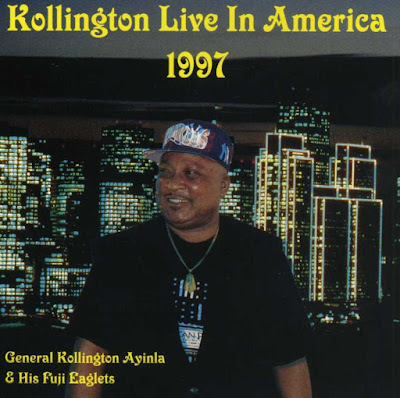 Kollington is said to have been born as Kolawole Ayinla Ilori in Ibadan in 1953 and started recording when he was in the Nigerian Army in the '70s. By the early '80s he was giving Barrister, fújì's acknowledged king at the time, a run for his money. Until Barrister's death in 2010, the rivalry between the two was fierce and acrimonious, although it's an open question how much of this was real and how much was a marketing ploy. Today Kollington swears his undying love of the late, great maestro. Unbelievably, my last post here on Likembe was on April 23, 2013 - more than four years ago! There's no one explanation for the hiatus - I've had other interests, other things going on. Thankfully, there have been no personal crises, no major medical issues (and thanks to the many who've inquired over the years for your thoughtful concerns). But I'm back now, and I'm going to try to post on a more consistent basis - at least once a week from now on. 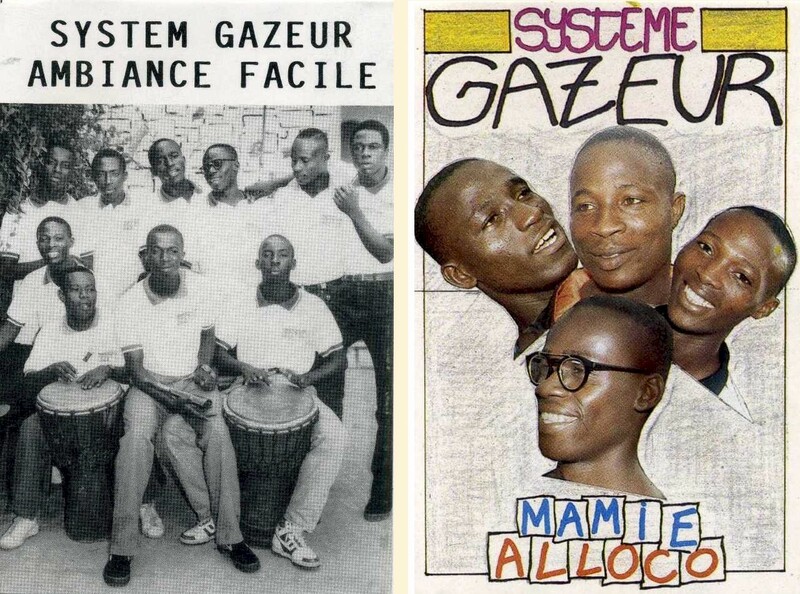 The African music blogosphere has changed a lot in the last four years, mostly not for the better. Old friends - With Comb & Razor, Oro, World Service and Electric Jive among others, have gone dormant or post infrequently. Others have disappeared altogether. I see Moos over at Global Groove is still hanging in there, and newer outlets like Mangue Music, My Passion for Ethiopian Music and Ndiakass have stepped into the breach. Needless to say, none of us is making any money doing this - it's all for the love. 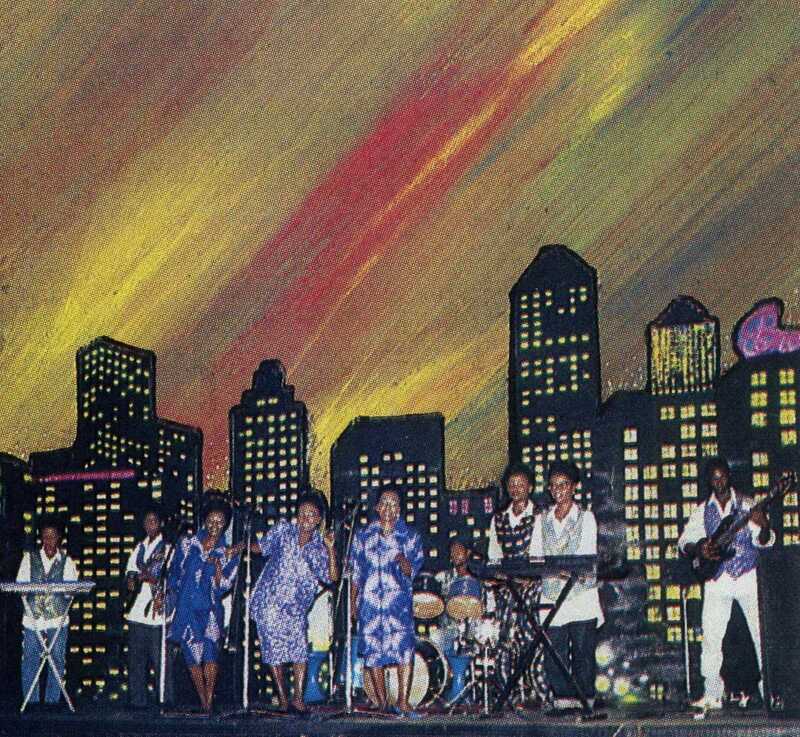 Maybe together we can bring about a revival of the African music scene online! 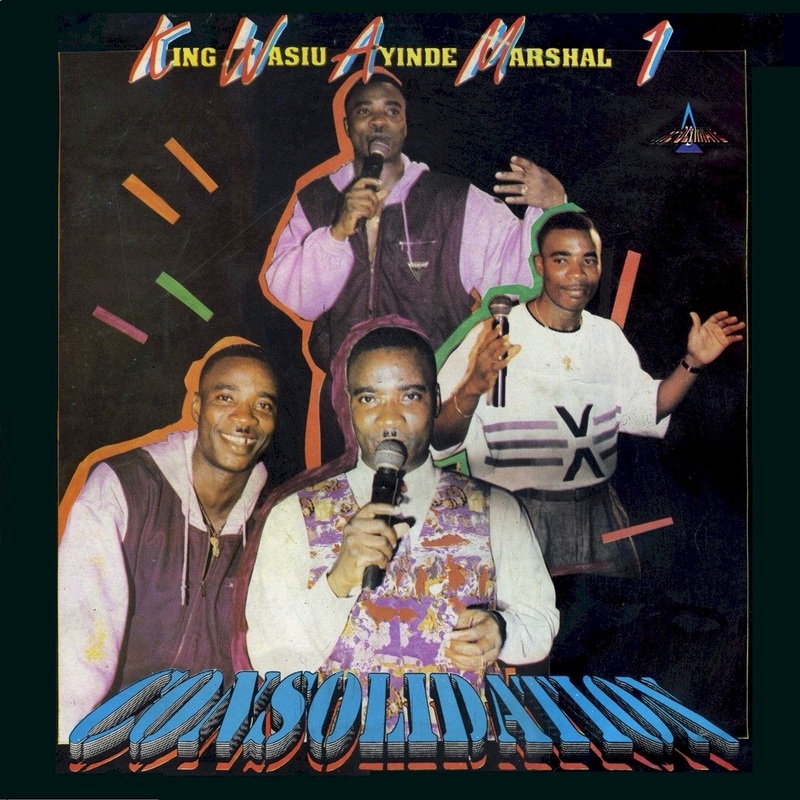 For Likembe's relaunching I'm posting King Wasiu Ayinde Marshal 1's Consolidation (The Ultimate Music TUMLP 001, 1994) which was pretty ubiquitous in Lagos, Nigeria during my first visit there in '94 - blaring, it seemed, from every other market stall and taxi. To me, the opening bars of "Show Colour" will always epitomize that wild, frustrating and fascinating city. I picked up the cassette back then, but the sound quality left a lot to be desired. What should I find, though, during a visit to Dusty Groove in Chicago a couple of months ago, but an almost-new copy of the LP version. Of course I had to share! The style of music here is fújì, which had its heyday in the Yoruba areas of Nigeria in the 1980s, when it overtook the better-known (in the West) jùjú music popularized by King Sunny Adé and Ebenezer Obey. Fújì derives from earlier Yoruba Muslim styles like àpàlà and like them eschews most non-percussion instruments (although more recent recordings utilize synthesizers and the like). Think of it this way: jùjú musicians are mainly Christian and the music is often influenced by church hyms, while f'újì is performed mainly by Muslims and hearkens back to the sort of music performed at Yoruba Islamic religious festivals. The vocal styles as much as anything else set the two genres apart. But I don't want to create an unnecessary dichotomy here - fújì and jùjú are popular in both communities! For those interested in further exploring Yoruba Muslim music, I've written two previous posts, "The Alasa of Ibadanland" and "Yoruba Muslim Women's Music." King Wasiu Ayinde Marshal 1 (b. Wasiu Ayinde Adewale Omogbolahan Anifowsha, 1957) got his start in the Supreme Fuji Commanders of Sikiru Ayinde Barrister, one of the founders of the modern f'újì style in the '70s, and broke out on his own in the early '80s with the confusing moniker Wasiu Ayinde Barrister and a number of smash hit LPs. By the nineties he'd changed his stage name to King Wasiu Ayinde Marshal 1 (later to KWAM I and later still to K1 De Ultimate) and was at the top of his game. He's continued to innovate within the fújì genre, adding new instruments and drawing upon influences like rock and hip-hop. Check out this medley of recent tunes that mostly can barely be described as fújì at all - the percussion section is almost overpowered by saxophone, guitar and synth! For those interested in exploring further online, the Nigerian media is rife with tales of KWAM 1's acheivements, his controversies with other musicians, and descriptions of his opulent palace in Ijebu Ode, complete with snakes and crocodiles. But for now, let the music speak for itself! Download Consolidation as a zipped file, complete with cover and label art, here.